Second time in nearly two months British Parliament rejects agreement between EU and Britain to regulate British withdrawal from Union. British Prime Minister Theresa May was defeated in a vote held this evening in British Parliament on the agreement regulating Britain's withdrawal from the European Union - the Brexit Treaty. In a vote in the British parliament, the agreement was toppled by a large majority of 391 to 242, after dozens of members of May's Conservative Party voted against the agreement. 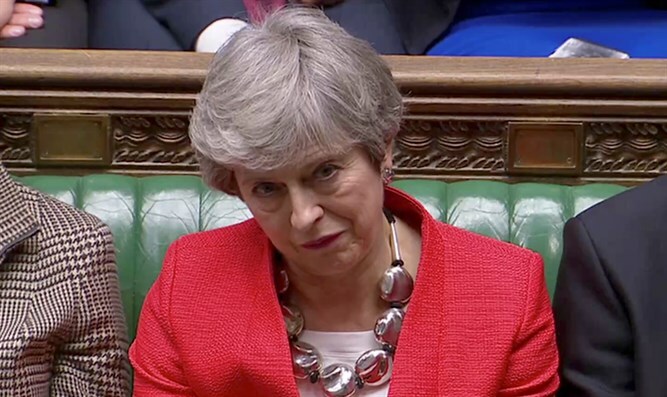 This is the second time in two months that the British parliament has rejected the agreement reached between the EU and the British government, and a particularly stinging defeat for Theresa May, who hoped that this time she would be able to bring about the agreement. Now May will have to decide whether to meet her commitment and bring before British parliament a proposal to quit the EU without an agreement, in about two weeks. The scenario of withdrawing from the EU without an agreement raises serious concerns both in London and in Brussels, but as of now there is no other solution to the crisis. If the British parliament does not approve a withdrawal from the EU without an agreement, May will propose to parliament a postponement of the withdrawal from the European Union by several months to renegotiate an improved agreement. However, it is hard to believe such a rejection would change the situation after European Commission President Jean-Claude Juncker said yesterday the agreement that was added yesterday was "the last step; there will be no more negotiations with Britain."